The sonnet is inexhaustible. Magnetic, mesmerizing, bewitching, nearly every poet is drawn to the form at some point in their career, whether they long to write the perfect sonnet, the Shakespearean, Petrarchan or Spenserian, or they desire to break the form, queer it, manipulate it, celebrate its mutability; they want to discover what magic can happen within those fourteen lines. For some poets the rule of the fourteen line is the only rule they follow, for others it’s the volta that defines the sonnet; poets like Ted Berrigan and Bernadette Mayer have loosened the sonnet into a mere skeleton of form. Other poets, Anna Maria Hong among them, are drawn to the challenge of formalism itself, and use the form to crystalize their own language. For all poets, even the most plainspoken, are drawn to the mysterious power of sound. Anne Carson wrote in “The Glass Essay,” “It is as if we have all been lowered into an atmosphere of glass,” and this is the atmosphere of Anna Maria Hong’s debut collection Age of Glass. Inspired by Leopold and Rudolf Blaschka’s 19th century glass sculptures, one which graces the cover of this collection, Hong’s sonnets are akin to these gorgeous specimens of blown glass. The Blaschkas, Hong explains in her notes, were glass replicas of natural specimens, most often plants and invertebrate creatures. Within them science and art comingle, as within the sonnet where an almost mathematical formalism is brought to life with the breath, the way glass is formed also by the breath—the breath of the artist trapped inside, preserved. And yet, we no longer see the breath of the artist or poet, but what was formed by it. who makes women apologize to exist. And yet, Hong is less interested in thematics than she is with language itself, the poems in Age of Glass revolve around language, one might say the thinginess of language. Hong’s poems often feel as if sprung from their rhymes and their rhythms, creating poems highly aware of their own artifice, poems that at times critique the artifice of the sonnet historically, particularly love sonnets. In “King Worm,” Hong constructs an entire sonnet out of four words “I” “do” “love” “you” as if searching for the finite number of configurations within those words, and within love itself, but also underlining the futile elements of language as well. At the center of these sonnets is subversion, Hong works to expose cracks in the glass of language, fairytales, myths, and fables and with her pen she makes more cracks. In the Age of Glass, anything can break, and many things perhaps should be broken. fairy fiction of the fraternal Grimm. one fat, one finally fed up—give fate a firm shove. 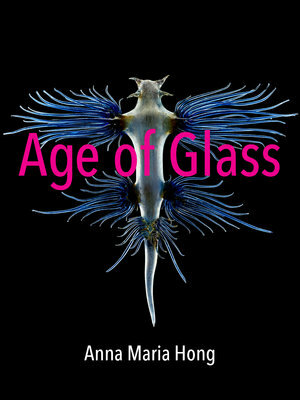 In many ways, Anne Maria Hong’s Age of Glass is a challenging book, it is riddled with riddles, puzzles, cast spells, elixirs, pure language play; the poems are as obscure and opaque as they are clear and dazzling. It is this unexpected texture and Hong’s degree of experimentation with formalism that makes this book both exciting and relevant. Hong concludes the opening poem, “The Copper Age” with the lines, “The world would crack extravagantly spent, / a shining exemplar or ornament.” This collection is at times a shining exemplar of the sonnet and a linguistic ornament, but it is at its best when illuminating the cracks in world and transforming them through language into art.